This article is only intended for users running the Mozilla Firefox Web browser on Linux, Mac OS X, and Windows operating systems. Although Firefox's user interface does not take up a significant amount of real estate, there are still occasions where the browsing experience is better when free from distractions with just the web content viewable. In cases like these, Full-Screen mode can come in very handy. Activating it is a very simple process. This tutorial walks you through it step-by-step on the Windows, Mac, and Linux platforms. To activate Full-Screen mode, click on the Firefox menu, located in the upper right-hand corner of your browser window and represented by three horizontal lines. When the pop-out menu appears, click Full-Screen, circled in the example above. You can also utilize the following keyboard shortcuts in place of this menu item: Windows: F11; Linux: F11; Mac: COMMAND + SHIFT + F.
To exit Full-Screen mode at any time, simply use one of these keyboard shortcuts a second time. 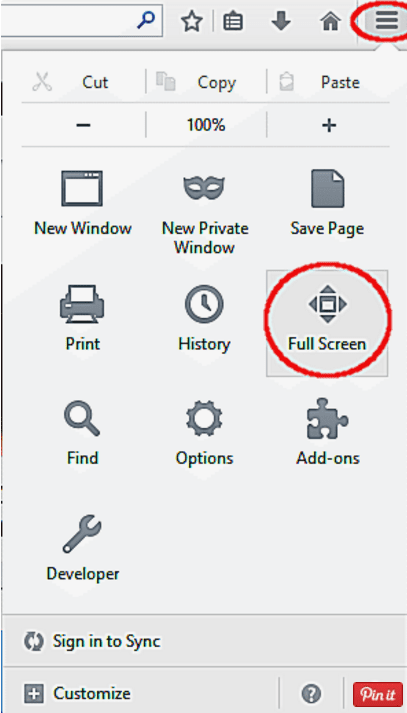 How Do You Activate Full-Screen Mode in the Opera Browser?